You can support us by giving $25 or more today! GIVE $25 or MORE NOW! Imagine a Safe Place for Kids to Have Fun on a Friday Night! AgnesCenters was founded by Grace Crockett and co-founded by Mercedes Booker. This mother and daughter team has a passion for helping others overcome domestic violence as they share their own testimony of overcoming domestic violence. Agnes' Centers For Domestic Solutions was incorporated on December 4, 2012 and is a 501(c) (3) non-profit organization. The vision of the center is "Building overcomers one testimony at a time, while ending the cycle of domestic violence." Revelation 12:11 "And they overcame him because of the blood of the Lamb and because of the word of their testimony, and they did not love their live even when faced with death." 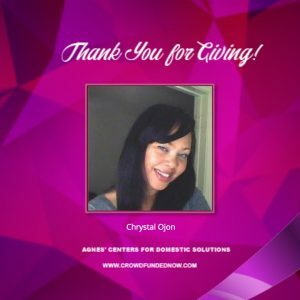 Our mission is to aid and assist individuals and families affected by domestic violence. The center has programs and services that focus on empowering victims and educating the perpetrators that are ready to end the cycle of abuse in their lives. Our trained, educated, and professional staff addresses each individual's needs as they progress through our programs. Agnes' Centers goal is to help individuals across the world transition from victim or perpetrator to an Overcomer. "Building Overcomers one testimony at a time while ending the cycle of Domestic Violence"
Please Visit Our Thank You Wall!